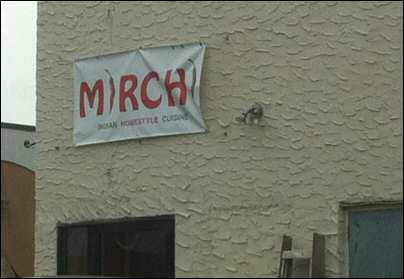 When we heard that a new Indian restaurant Mirchi had opened on Oak Tree Road in Edison we were eager to try its food. Although there are restaurants to suit every budget and palate on Oak Tree Road in Edison and Iselin, the area has turned into the Capital of bad Indian food. If our memory serves us right, many of these joints mushroomed because of the hungry bachelors in the form of the H-1B wave swept on to the shores of Edison, and the rest of New Jersey. But with the downturn in the economy, and most of the H-1Bs gone for good from the U.S, we feel it'll be an uphill battle for the remaining restaurants on Oak Tree Road to stay in business, or thrive if they don't change the way they do business. The once packed restaurants of Oak Tree Road are watching in agony as their customer base dwindles. It's a shame that desperation is driving some New Jersey restaurants to post fake reviews about themselves on sites like Yelp, Insider Pages and more. All they have to do is serve consistently cook good food, so people can genuinely write honest reviews of their service, and food. So in the spirit of providing an unbiased guide to diners, the other day we decided to put the new local Indian Restaurant, Mirchi on Oak Tree Road in Edison to the taste test! But before we go on to Mirchi's food and service, we must warn you that if you are driving over to Mirchi you need to watch out for the steep climb. If you continue up the short hill, the under carriage of your car could suffer some serious damage. So make sure to adjust your speed to minimize the damage to your car. That said, read on to learn how Mirchi Oak Tree Road fared on the food taste, decor, courtesy and cleanliness scorecard. Mirchi Edison's ambience is not much to write home about. It's a simple long hall with the kitchen/ordering station on the left side, and some tables on the right. We did not find any people in the restaurant at the peak of the evening rush hour. To get a good feel for Mirchi's food we ordered one vegetarian appetizer, one vegetarian entree and one Chicken Biryani and one Tandoori Chicken item for takeout. Pricing seemed reasonable for most items. Here is how Mirchi Indian restaurant scored overall. The restaurant was clean and the two hosts/waiters were pleasant, and very courteous. But one of the waiters was watching videos on his mobile phone in our presence, which was annoying, because it was really loud. They asked us to wait for 25 minutes for the Tandoori Chicken, which was ok since fresh chicken takes that long to prepare. Since our order was for a takeout, we paid close attention to the plastic ware/condiments, and napkins etc. They neatly placed our order in a brown paper bag with three little containers filled with raita, gravy and chutney. But plastic spoons, knives, forks, plates and paper napkins were not provided with our takeout order. As soon as we picked up the food, we headed home immediately eager to taste the Spicy Andhra Tandoori Chicken and Cut Mirchi et.al. 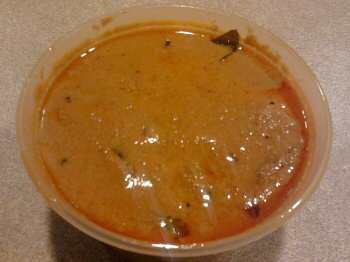 Our order of Cut Mirchi included about 12 pieces and came with green color chutney in a small plastic container. 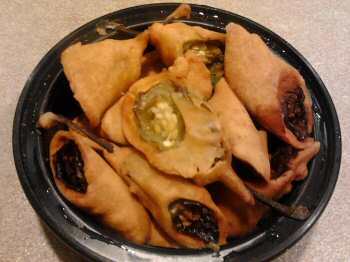 The batter/shell was tasteless; there were no spices in the batter at all. The batter/shell for the Cut Mirchi was crunchy instead of moist. They must think our taste buds are blind. Either that, or they were hoping we would dip the Cut Mirchi into their chutney and not find out. The shell was so crunchy that you could inflict some serious injury on someone if you flung Mirchi's Cut Mirchi at them. Eating Mirchi's Cut Mirchi felt like as if we were chewing on cardboard. Also the batter got hard by the time we got home and that ruined the fun. The Cut Mirchi looked like that it had been in the freezer for a couple of days before being re-fried and given to us and which is why we think the batter was rock solid. 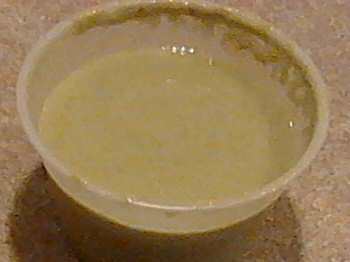 The accompanying green color chutney was spicy, but not flavorful, and was watery. Disappointed with our Cut Mirchi appetizer, we moved on to our second Mirchi item Mirchi Ka Saalan which came with white rice. No sooner did a spoonful of Mirchi Ka Saalan touch our taste buds, than we retreated in disappointment. For Mirchi Edison's Mirchi Ka Saalan was sweetish. Mirchi Edison's Mirchi Ka Salan was anything but mirchi ka salan like. Sure, we tasted the peanuts in there, but overall the curry was sweet instead of spicy. We are no strangers to Mirchi Ka Salan and we have had some great variations of this mirchi delicacy. But Mirchi Edison's Mirchi Ka Saalan version was foreign to our taste buds. Authentic Mirchi Ka Saalan is more thick, and it is definitely not sweet. Mirchi's kitchen should work on the overall recipe, as this one didn't make the mark. Mercifully, relief to our taste buds came in the form of Mirchi's Chicken Biryani. 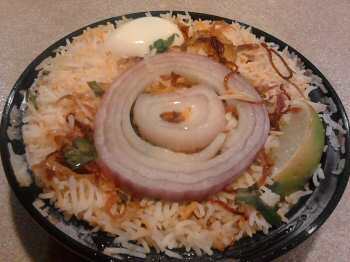 Chicken Biryani came with all the bells and whistles. It included boiled egg, raw onions, coriander and fried onions and came with raita and gravy on the side. The unique quality of Mirchi's biryani was that the chicken pieces were well marinated. The rice was coated with just the right amount of spices. The fried onions added a nice texture to the whole dish. The Chicken Biryani was well cooked, just the way we like it, and surely others would like it too. 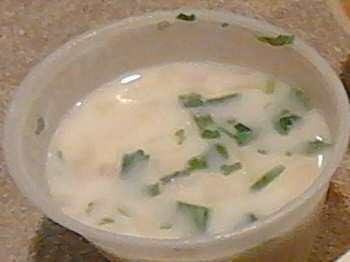 But the Raita was very watery. Gravy was also a bit too watery. 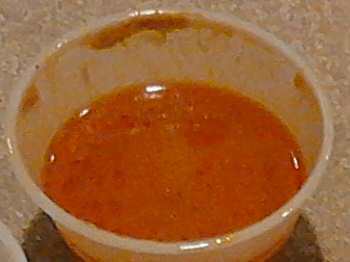 Gravy was flavorful, but needs to be a little bit thicker in our opinion. We finished the entire Chicken Biryani in one sitting. Note to chef, don't change anything with the recipe. While we enjoyed the Mirchi's Chicken Biryani what really made our dinner was its Andhra Tandoori Chicken (SPICY). Of the four items we picked up from Mirchi Edison, the one that stood out most taste wise was Andhra Tandoori Chicken. Readers of this review may wonder what is special about the Mirchi Edison's Andhra Tandoori Chicken and how is it different from regular tandoori chicken. The Hyderabad Andhra Tandoori Chicken is almost like the regular version but varies in one respect. Andhra Tandoori Chicken is spicier than the regular version. The chicken was well marinated. 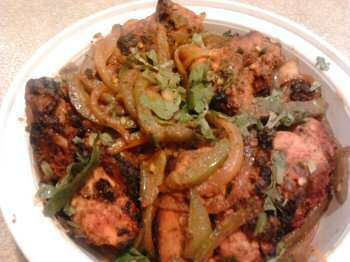 Andhra Tandoori Chicken was done just right so that the meat is neither too soft, nor too hard. The combination of spices was just right, and no single spice overpowered the other spices. On the whole it was worth waiting for 25 minutes to get the Andhra Tandoori Chicken ready. When we stepped into Mirchi, we didn't expect the Taj Mahal, but a decent meal. On our taste meter, Mirchi Edison ranked well on the non-vegetarian dishes and below average on the vegetarian dishes. The serving size is decent for the price you pay. Also, it would be nice if the wait staff keep away their mobile phones when customers are present and play the videos little softer rather than loudly.